The Model Rules form our governing document and this contains a section known as an "Asset Lock". 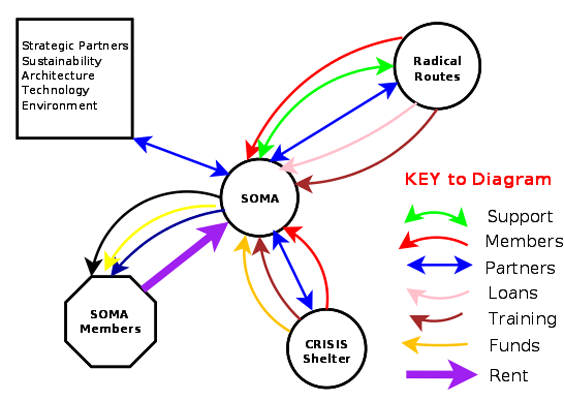 This shows that SOMA is a not for profit organisation. This part of the Model Rules ensures that if SOMA has to cease trading, then all assets must be either, sold to, or be donated to another organisation which must have the same or similar, aims and objectives. Each member owns only one share in the company. This share has a value of £ 1 and is a member's only liability in the event that things do go seriously wrong, ie; a situation in which the co-op has irresolvable debts and has to cease all activities. As a consequence of the Asset Lock, there will never be a distribution of dividends to members. Any income "surpluses" which are generated through rents, trade or other business, are ploughed back into SOMA for use on housing stock and other projects. This strategy was adopted by the members as a means to prevent the capitalisation of shares for private profit, or a power group arising in the co-op. This aims to give SOMA members a greater feeling of security in their home and also make them assured of having a truly equal stake in the decisions making process. All of this can be read in great detail in the Model Rules which are available for download in .pdf format by using this link to SOMA's Model Rules . You will need Adobe Reader or an equivalent. At the present time running costs are quite low, being for basic administration and other business activities like marketing, which are being conducted by David Urmston as an employee of Oxford PC Solutions (OPCS). The fee for this service will be paid retrospectively when the job is complete and with the agreement of SOMA members. 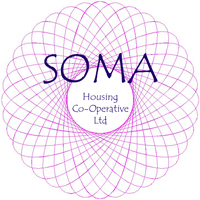 The OPCS management services company is a not for profit organisation and operates with the agreement of the Management Committee of SOMA Housing Co-Operative Ltd. It has been agreed in theory that co-op members who assist with management, administration or maintenance of the co-op could be paid a "Sweat Equity". It has been suggested that this could be received as a reduction in rent, or in some other pre agreed form.